BROWNWOOD—Baptists began to deal with clergy sexual abuse more significantly when a few women rose to powerful positions in denominational life, one of those women told a crowd at Howard Payne University. Suzii Paynter, executive coordinator of the Cooperative Baptist Fellowship, spoke on “Women’s Leadership, Global Mission and Course Correction” during the Currie-Strickland Distinguished Lectures at HPU. “Can we redeem power with power?” she asked, describing how she worked to address issues of clergy sexual abuse alongside Diana Garland, dean of Baylor University’s School of Social Work; Pam Durso, executive director of Baptist Women in Ministry; and Shauw Chinn Capps, immediate past moderator of CBF. Garland followed up that research with additional study into the prevalence of clergy sexual abuse and the systemic conditions that make it possible. Lack of personal or community response to situations that normally call for action. A “culture of niceness” in churches that overlooks or ignores inappropriate behavior rather than calling it out and causing embarrassment or pain to the perpetrator. Lack of accountability regarding where and with whom religious leaders spend their time. Overlapping and multiple roles, in which a minister is spiritual leader, counselor, friend, confidante and “family” figure. Trust in the sanctuary and the belief congregants can be vulnerable around clergy without fear of manipulation. About that same time, Paynter became aware of a specific case of clergy sexual abuse involving a young single woman who was sent to the mission field where her clergy supervisor systematically abused her. Eventually, the woman sought legal counsel, and she received a lump sum financial settlement on the condition that she remain silent about the incident. The woman’s pastor “was outraged on her behalf” and sought support for her, she said. Paynter contacted Garland, who helped connect the woman with a trauma therapist. Paynter and Garland recognized the typical institutional response in Baptist life focused on risk-management rather than the biblical approach as Jesus taught in the parable of the Good Samaritan. Paynter said she and Garland took the lead because someone had to do it. “One aspect of our women’s collaborative leadership was to help create additional processes—to add to a legal response a moral and ministerial obligation within the parameters of Baptist polity and structure” to provide a measure of protection for the future, she said. “If we’re not Good Samaritans yet, we’re at least a little better Samaritans,” she said. Formative work with Garland on clergy sexual abuse helped shape policies at CBF after Paynter arrived there nearly five years ago. “Acknowledging the bias that can develop in within organizational partners, CBF has engaged the professional support of trained third-party investigation, consultation and coaching from the Center for Congregational Health to both accused and accuser,” Paynter said. In 2016, Durso at Baptist Women in Ministry proposed that her organization and CBF form a task force to focus on prevention of clergy sexual misconduct. The task force agreed to create and distribute model policies based on best practices, provide educational opportunities and develop resources for survivors of abuse. Durso was named co-chair of the task force, along with Stephen Reeves, former public policy director at the Texas CLC who now leads advocacy efforts at CBF. “If there is a #metoo tipping point in general, there is certainly a strong response by a dedicated task force under Pam’s leadership,” Paynter said. Capps, who became named moderator-elect of CBF in 2016 and moderator in 2016, entered that role with a concern for abuse survivors. She is chief executive officer of Hopeful Horizons, a nonprofit organization in South Carolina that provides safety and healing for victims of child abuse, domestic violence and sexual assault, and she considered Garland a mentor. “Her place of visible leadership, her vocation in victim assistance and her connections with Diana Garland provided an open door to a vulnerable group of seekers,” Paynter said. Last year, several women who survived clergy sexual abuse asked to meet with Capps and Paynter. The group included the missionary Paynter and Garland encountered 10 years ago. In a second lecture, Paynter focused on new approaches in global missions characterized by diverse models and congregational engagement. “God has been preparing us as U.S. Christians to welcome, embrace and love our world,” she said. In particular, she observed, congregations see their identity as missional and want greater direct engagement with the global church. 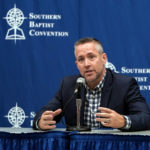 At the same time, as missiologist Rob Sellers has observed, the role of missionary has shifted from “central figure and proclaimer” to “equipper and enabler of others,” and missions has moved from proclaiming propositions to developing relationships among global partners, Paynter said. Career missions personnel live out their calling alongside missional congregations within the contexts of global poverty, global migration and the global church, she noted. “The Bible comes alive to us through the global church,” she said. Bearing witness to Jesus Christ. Cultivating beloved community—communities of reconciliation and hospitality.